UK-Trailer-Parts | Trailer infomation and maintainance | Please visit www.towingandtrailers.com for all the parts included on this site. Many modern cars have Multiplexed or Can bus wiring systems. Wiring systems such as Can bus were developed in order to be a simpler and more cost effective alternative to the traditional wiring harness. This advancement in wiring has also led to the development of various fault finding and diagnostic systems. One fault finding system sends small test pulses to all of the lights in the system to identify faulty bulbs. If a faulty bulb is detected the diagnostic system will display a symbol on the dashboard, alerting you to the fault. This system can cause problems when trying to fit a tow bar, LED lights, or even when towing a trailer that has been fitted with LED trailer lights. Unlike regular bulbs, LED lights are so sensitive they will pick up the small test pulses through Can bus and flash constantly. As well as constant flashing, LED lights do not have sufficient ‘Load’ enough to trigger the diagnostic system and dashboard warning symbol. This can be avoided by fitting an expensive manufacturer approved plug-in wiring kit when your tow bar is installed. This should resolve any problems with the diagnostic or fault finding systems, but it won’t be cheap. 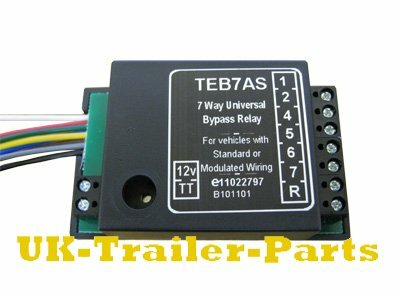 Fitting this Universal Bypass Relay to your car between the wiring system and trailer plug socket bypasses all of the fault finding and diagnostic systems created by Can bus. This basically leaves you with a standard 12v power supply. This allows LED lights to function properly, without flashing, at a the fraction of the cost of a dedicated plug-in kit. 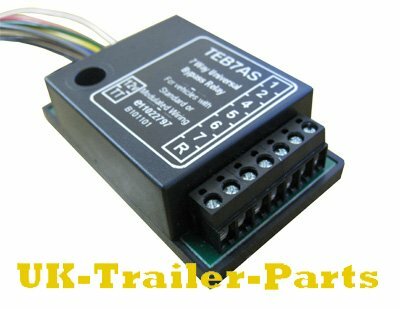 This relay isolates the 12v power supply and bypasses any fault finding or diagnostic systems after the relay. A fuse should be fitted to the relay’s power supply so in the event of a fault or short circuit your car remains unaffected. 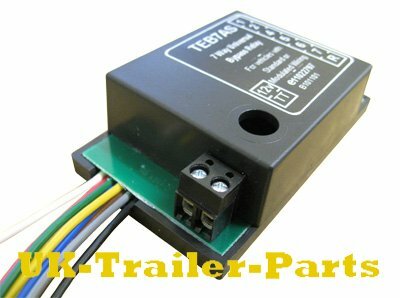 Please be aware that no system on your car will alert you to faults with your trailer’s lights while using this relay. 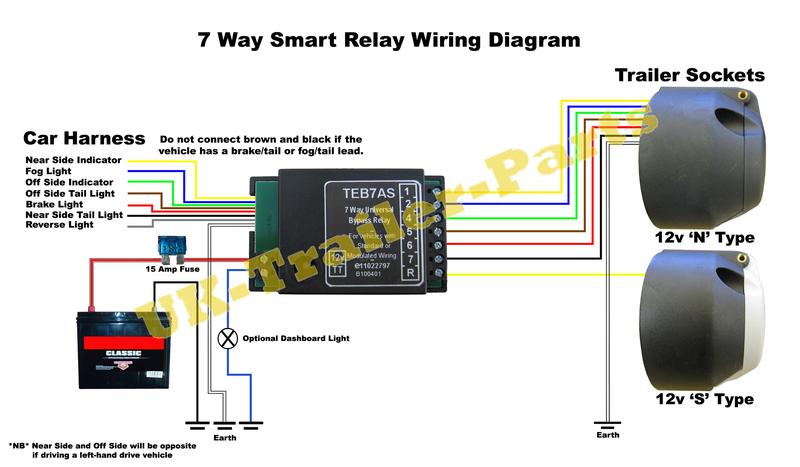 On the left hand side of the relay are 8 colored cables, a 12v power terminal, and another terminal marked TT. The 12v power terminal requires a dedicated feed (with fuse) directly from the cars battery, while the terminal marked TT is for an optional ‘tell tale’ dashboard light. On the right hand side are 7 terminals marked 1, 2, 4, 5, 6, 7 and ‘R’. There is no terminal 3 as this is an earth wire which must be secured to the vehicles bodywork. These correspond to the pins in the trailer plug socket and are wired as shown below. Why is my Trailer banging when I Brake?